The week that went by saw the benchmark NIFTY ended the with flat once again for the second time as the Index closed flat with minor gains of 38.75 points or 0.37%. If we analyze the past month (i.e. 4 weeks), the first two weeks ended with net loss of 3% each week and the previous two weeks have ended flat with NIFTY gaining 0.03% and 0.37%. Going by this data, we can fairly assume that the benchmark has struggled but fiercely attempted to find base in the support area of 10276-10370 zones. The next week is a short week with Friday, 30th March being a holiday on account of Holi. We had mentioned last week that longer the Markets remain around 100-DMA on the Daily Charts, larger will be the chances of short covering. Going into trade on Monday, we see that the Indian Markets may get a positive start and it is likely to continue with the up move that it saw on Friday. We are likely to see a follow through move, at least in the initial trade on Monday. The next week will see the levels of 10300-10276 acting as strong support even if the NIFTY see weakness once again. Though seeing such weakness is relatively unlikely. On the upper side, the zones of 10620 and 10735 will act as immediate resistance area for the Markets. Relative Strength Index – RSI on the Weekly Chart is 54.9661 and it stays neutral showing no divergence against the price. The Weekly MACD is bearish as it trades below its signal line. On the Candles, a long lower shadow occurred. This is typically a bullish signal especially when it occurs after a decline. 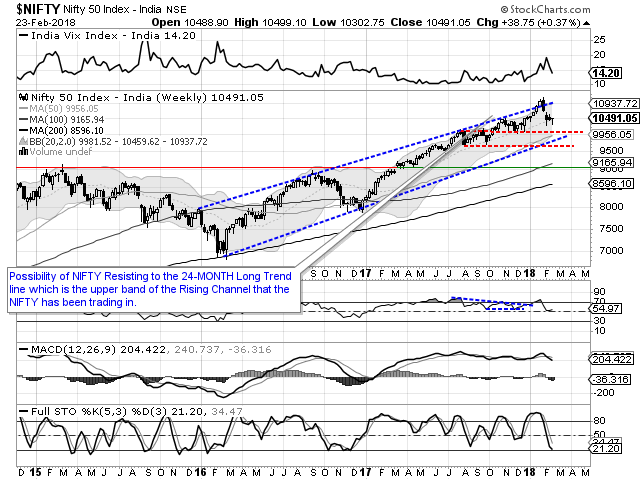 While having a look at pattern analysis, we see that the NIFTY has taken support at its 20-Period Moving Average on the Weekly Charts. 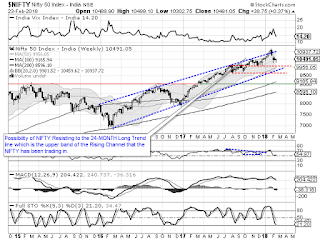 It still continues to remain in the 24-month long upward rising channel and has not shown any structural damage on the Charts post the recent correction. Also, it has evidently out-performed some of the markets which saw correction in the range of 8-10%. Overall, positive start to the trade is likely to Monday and some follow through up move is expected. The F&O data also suggest that short covering took place and some of the shorts also stood replaced with fresh buying. We will see NIFTY inching towards 10615-10650 in all likelihood. We continue to remain positive for the coming week and recommend making select purchases while continuing to protect profits at higher levels. Shorts may be avoided. Positive outlook is advised for the coming week. 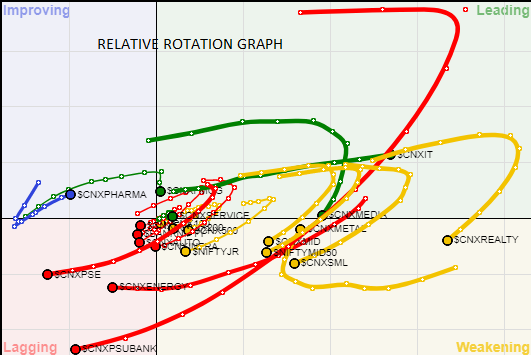 A study of Relative Rotation Graphs – RRG shows that sectors like PSU Banks, Public Sector Enterprises, (PSEs), INFRA, Financial Services, BankNIFTY, AUTO, have continued to slip further in the lagging quadrant losing both on relatively ratio and momentum. In the coming week, we see that IT is likely to hog the limelight remaining strong relative outperformer along with select Media and FMCG. Media and FMCG remain in leading quadrant but still continue to lost momentum. METAL pack is also likely to see improved relative performance in coming week as it is seen sharply improving its relative momentum when benchmarked against the NIFTY.